Wolff-Parkinson-White (WPW) syndrome is a condition in which there is an extra electrical pathway in the heart. The condition can lead to periods of rapid heart rate (tachycardia). WPW syndrome is one of the most common causes of fast heart rate problems in infants and children. Normally, electrical signals follow a certain pathway through the heart. This helps the heart beat regularly. This prevents the heart from having extra beats or beats happening too soon. 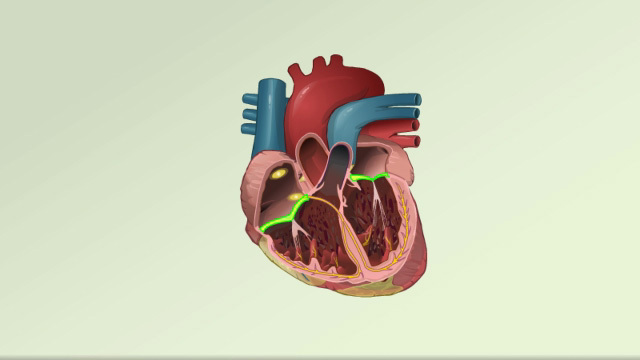 In people with WPW syndrome, some of the heart’s electrical signals go down an extra pathway. This may cause a very rapid heart rate called supraventricular tachycardia. Most people with WPW syndrome do not have any other heart problems. 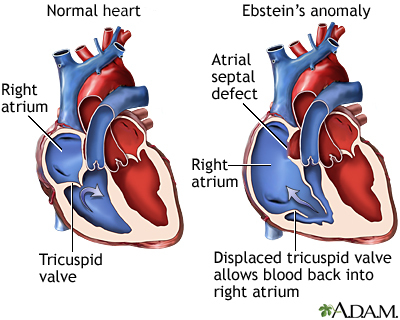 However, this condition has been linked with other cardiac conditions, such as Ebstein anomaly. A form of the condition also runs in families. How often a rapid heart rate occurs varies depending on the person. Some people with WPW syndrome have only a few episodes of rapid heart rate. Others may have the rapid heart rate once or twice a week or more. Also, there may be no symptoms at all, so that condition is found when a heart test is done for another reason. A physical exam done during a tachycardia episode will show a heart rate faster than 100 beats per minute. A normal heart rate is 60 to 100 beats per minute in adults, and under 150 beats per minute in newborns, infants, and small children. Blood pressure will be normal or low in most cases. If the person is not having tachycardia at the time of the exam, the results may be normal. 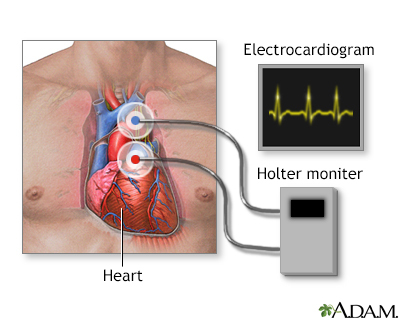 The condition may be diagnosed with an ECG or with ambulatory ECG monitoring, such as a Holter monitor. A test called an electrophysiologic study (EPS) is done using catheters that are placed in the heart. This test may help identify the location of the extra electrical pathway. If the heart rate does not return to normal with medical treatment, doctors may use a type of therapy called electrical cardioversion (shock). The long-term treatment for WPW syndrome is very often catheter ablation. This procedure involves inserting a tube (catheter) into a vein through a small cut near the groin up to the heart area. When the tip reaches the heart, the small area that is causing the fast heart rate is destroyed using a special type of energy called radiofrequency or by freezing it (cryoablation). This is done as part of an electrophysiologic study (EPS). Open heart surgery to burn or freeze the extra pathway may also provide a permanent cure for WPW syndrome. In most cases, this procedure is done only if you need heart surgery for other reasons. Catheter ablation cures this disorder in most people. The success rate for the procedure ranges between 85% to 95%. Success rates will vary depending on the location and number of extra pathways. The most severe form of a rapid heartbeat is ventricular fibrillation (VF), which may rapidly lead to shock or death. It can sometimes occur in people with WPW, particularly if they also have atrial fibrillation (AF), which is another type of abnormal heart rhythm. This type of rapid heartbeat requires emergency treatment and a procedure called cardioversion. You have symptoms of WPW syndrome. You have this disorder and symptoms get worse or do not improve with treatment. Talk to your provider about whether your family members should be screened for inherited forms of this condition. Tomaselli GF, Zipes DP. Approach to the patient with cardiac arrhythmias. In: Zipes DP, Libby P, Bonow RO, Mann DL, Tomaselli GF, Braunwald E, eds. Braunwald's Heart Disease: A Textbook of Cardiovascular Medicine. 11th ed. Philadelphia, PA: Elsevier; 2019:chap 32. Van Hare GF. Disturbances of rate and rhythm of the heart. In: Kliegman RM, Stanton BF, St. Geme JW, Schor NF, eds. Nelson Textbook of Pediatrics. 20th ed. Philadelphia, PA: Elsevier; 2016:chap 435.